Having literally spent my entire life in church, I cannot count the number of times I have heard it said that we are admonished, or even commanded, to be Bereans. But are we? Where is that found? It may seem like a minor point, but nowhere in the New Testament is there a command to be Bereans. And if we are going to claim to be guided by the Bible, then when we use Bible terms we need to use them with accuracy. So what is said about this relatively successful encounter was that they were open-minded, and looked into what Paul was saying to give it a fair hearing and see if this was true or not. They were intellectually honest; that’s all. In fact, while many did believe, some did not. But at least they were open-minded enough to hear him out and research things before jumping to any conclusions. If you are like that, then you can see here that such an approach can be profitable. Thessalonica is mentioned in the preceding verses as a contrast to those in Berea. What made the Bereans more open-minded, or noble? Well let’s see from chapter 16. So the difference was that the Bereans didn’t form a mob, riot, and want some body to die because of the message about Jesus Christ. Want to be a Berean? Then when someone preaches something you are unsure of or unfamiliar with, research it instead of forming a riotous mob and trying to kill someone. Well if we are not commanded to be Bereans, then should we just believe everything a preacher says to us? No, but there are other verses that talk about that. There is no need to insert a command where there isn’t one in the text, for to do so makes us among those who add to the Word. And technically, you can be a Berean and reject the correct message, like some of them did in Acts 17. So what should we do if we hear preaching on a subject? Not everyone is going to get it 100% right every time. That doesn’t make them a false prophet; it makes them human and fallible. So test all things, whether it is teaching, a new practice, and see how it lines up with scripture. Whatever passes the test, keep. Whatever doesn’t, toss out. 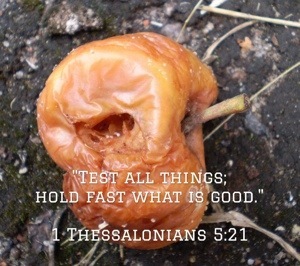 And tell your fellow believers that we are commanded to test all things. Just don’t tell them we are commanded to be Bereans when no commandment is there. We must handle the Word of God accurately if we are to show ourselves to be rightly dividing the Word.